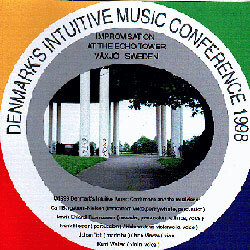 Last year’s DIMC disc (recorded in 1997) contained one of the most convincing examples of extended, large-group improvisation of the year. Although it sounds very different, this year’s proves likely to do the same for 1999. They’ve pushed things even harder this time, going for a single piece nearly an hour in length featuring some, but not all, of the same musicians. Rather unusually, the location of this recording is of prime importance. They’ve taken the group out of the concert hall and into an open-air space situated underneath the concave roof of an enormous water tank which amplifies the music and adds a series of at least six discrete echoes to more percussive sounds. The result lends itself well to the drifting, ambient textures which open the disc and which are never far away throughout the performance. The absence of horns means this group can work together to create close, anonymous clouds of sound. The recorder, which in Rasmussen’s hands sounds like a shakuhachi, gives a Japanese sound to the opening minutes, and the piece as a whole has that contemplative attention to timbral detail so important to that music. Solos do come and go — Rasmussen’s at the start, Toft’s a third or so of the way in — but the overall impression is of a collective whose interest is in making the music as a whole work well. When solos arrive, they are often understated, and Toft’s is exemplary for the space it gives to his collaborators while still retaining its own musical interest. Sometimes the long echo can feel a bit overwhelming, but the players use it well. Long notes are enriched by the out-of-phase effect of the reverberation, making the group sound bigger than it really is; percussive sections bounce out of control and don’t last so long as is usual in these kinds of workouts. If it sometimes has the whacked-out feel of very early Sun Ra, it far more often has an ambient texture with long notes forming its backbone. All of the instruments, including the voices, typically hold their notes for fairly long periods, giving this piece a decidedly largo feel to it. The percussion itself is suitably muted and, except for a more soloistic section near the end of the performance, is used for accentuation rather than the provision of a rhythm track. There is, if you like, a final rhythmic section; the applause, which the natural echo samples and loops into an irregular ebb and flow.